WASHINGTON (Reuters) – U.S. House Judiciary Committee Chairman Jerrold Nadler said on Sunday that if the evidence shows that President Donald Trump obstructed justice in Special Counsel Robert Mueller’s Russia investigation, then it could be an “impeachable” offense. “If proven, some of this would be impeachable, yes,” Nadler said on NBC’s “Meet the Press.” Nadler said that Democrats are not currently pursuing such an action, but that they plan to “go where the evidence leads” them. (Reuters) – Vulnerable House Democrats, mindful of President Donald Trump’s continued strength among Republican voters, are using caution in how they respond to the special counsel’s report, which detailed Trump’s efforts to thwart the investigation into Russian efforts to help him win the White House. More than 30 Democratic representatives, many of whom are in their first term, represent districts that supported Trump in 2016. The party’s chances of keeping control of the U.S. House of Representatives likely hinge its ability to defend those seats. In the report released on Thursday, Special Counsel Robert Mueller said Trump may have obstructed justice and portrayed a president bent on stopping the probe into Russian meddling. But Mueller stopped short of concluding that a crime was committed, leaving it to Congress to make its own determination. That is putting pressure on congressional Democrats to decide whether to pursue impeachment charges against Trump, whose continued popularity with his Republican base could weigh heavily on Democratic lawmakers in swing districts. Those incumbent Democrats may have to strike a delicate balance on the campaign trail next year. Too much bashing of the president could turn off voters more interested in kitchen-table issues and motivate Trump sympathizers to rally around him. Hours after Mueller’s findings were released, Abby Spanberger, a Democratic congresswoman from Virginia, held a town hall that saw virtually no discussion of the report. She knocked off a Republican incumbent last year in a district that favored Trump by more than 6 percentage points in 2016. The 39-year-old representative told reporters before the event that she was more interested in preventing Russia from attacking the electoral process than in “re-litigating” the 2016 presidential contest. “Regardless of what actions the president did or didn’t take … understanding in far greater detail the aggression of a foreign adversary nation against our election’s infrastructure should ideally help us avoid such circumstances in the future,” she said. Other Democrats facing reelection in swing districts also reacted cautiously, saying they would reserve judgment until after reading the voluminous report, or emphasizing the threat of Russian interference rather than Trump’s behavior. “If the conclusion remains that there is no further criminal wrongdoing, I think we should, as a country, move on and ensure that Russia cannot interfere again,” said Ben McAdams, a freshman Utah Democrat in a Republican-leaning district. The 448-page report’s release has sparked an internal debate within the Democratic Party on how to move forward. Party leaders played down talk of impeachment, even as they said they would pursue a full, unredacted copy of the report and bring Mueller himself to Capitol Hill to testify under oath. At the same time, some liberal members of the caucus, including Representative Alexandra Ocasio-Cortez of New York, expressed support for starting an impeachment inquiry. U.S. Representative Cheri Bustos, the Illinois Democrat who chairs the party’s House campaign arm, set the tone for her most endangered colleagues on Thursday. In a statement, she said she would read the report carefully, then pivoted to other issues. 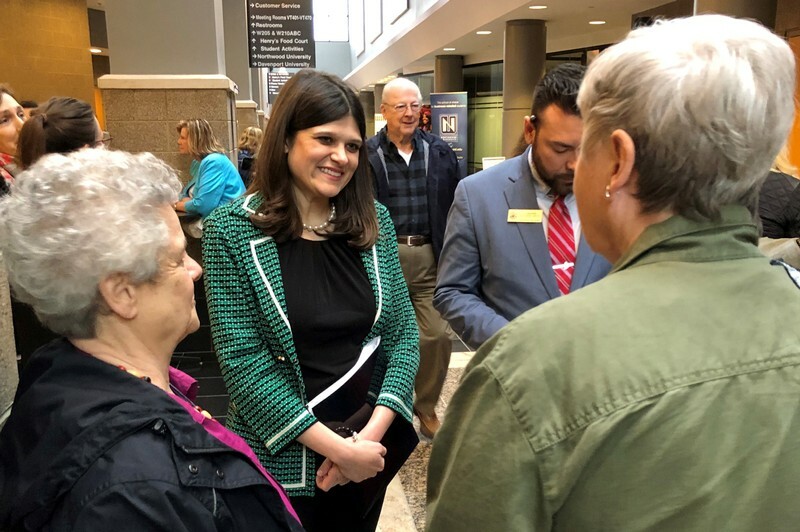 “As we review this report, I also remain committed to continuing my efforts to bring down the cost of health care, invest in our infrastructure and clean up the mess in Washington,” Bustos said. Still, speaking after a town hall on Thursday evening, the 35-year-old emphasized that most voters going into 2020 are more concerned about issues such as health care, education and infrastructure. The 46-year-old adult education administrator said Democrats should consider impeachment, based on the mountain of evidence in the Mueller report. But in a reflection of the difficulty of the strategic choice facing Democrats, she also said they should avoid making it a top campaign issue. Democrats looking to 2020 must also weigh whether voters’ views on the Russia probe are even susceptible to persuasion, given the country’s deep partisan divides. A Reuters/Ipsos poll conducted on Thursday and Friday after the report came out found 50 percent of Americans agreed that Trump or someone from his campaign worked with Russia during the campaign, and 58 percent of respondents said they believed Trump tried to stop investigations into the campaign’s conduct. Those figures, which split heavily along party lines, were fairly similar to previous polls. One senior Democratic strategist involved in shaping the campaign message for 2020 House candidates, who asked for anonymity when discussing the party’s internal thinking, said the party’s own research showed the Russia probe was not particularly resonant for voters. Still, he said Mueller’s findings would create the background “mood music” when Democrats talk in broad terms about corruption and government accountability. WASHINGTON (Reuters) – Former Republican presidential candidate Mitt Romney said on Friday he was “sickened” by the dishonesty of U.S. President Donald Trump and people around him as portrayed in a report on Russia’s attempts to influence the 2016 election. Romney, now a U.S. senator from Utah and an off-and-on Trump critic, was responding to the report by Special Counsel Robert Mueller, who described how Trump sought to disrupt the probe into ties between his presidential campaign and Russia. Mueller did not establish that Trump’s campaign team colluded with Moscow and he did not charge the president with obstructing justice, but the report provided extensive details of Trump’s efforts to thwart the probe. Romney said it was “good news” that there had been insufficient evidence to charge Trump with conspiring with a foreign adversary or obstructing justice, which he said could have triggered a constitutional crisis. “Even so, I am sickened at the extent and pervasiveness of dishonesty and misdirection by individuals in the highest office of the land, including the President,” Romney said in a statement posted on Twitter. “I am also appalled that, among other things, fellow citizens working in a campaign for president welcomed help from Russia – including information that had been illegally obtained; that none of them acted to inform American law enforcement; and that the campaign chairman was actively promoting Russian interests in Ukraine,” he added. 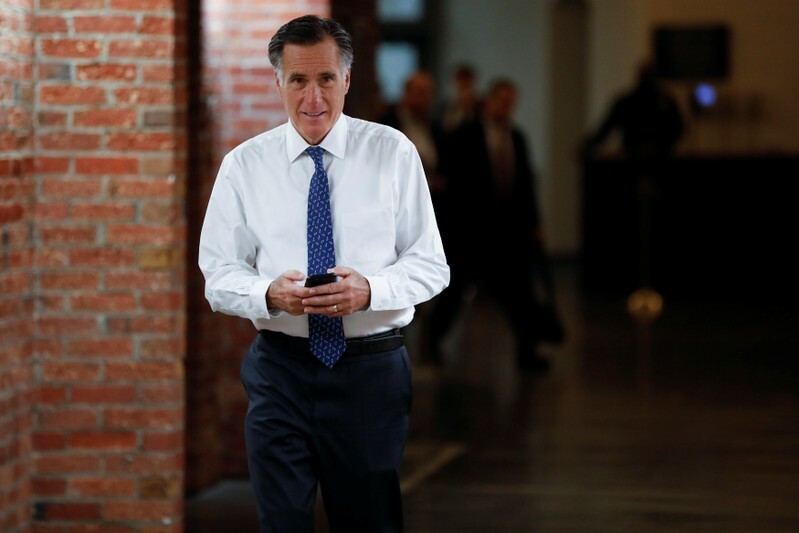 Romney was sharply critical of Trump during the 2016 presidential campaign before being considered briefly as a candidate for secretary of state in Trump’s administration. His sharp statement on Friday breaks with the position of other Republicans and the White House, which has declared the report a victory for the president. Trump has repeatedly dubbed the investigation a “witch hunt” and insisted he did not engage in collusion or obstruction. Trump remains popular with most Republicans but a potential challenge from someone such as Romney in the Republican primary process next year could complicate Trump’s bid to win a second term in 2020. Romney lost the 2012 presidential election to Democratic candidate Barack Obama. Congressional Democrats on Friday took legal action to get hold of all of Mueller’s evidence from his inquiry. 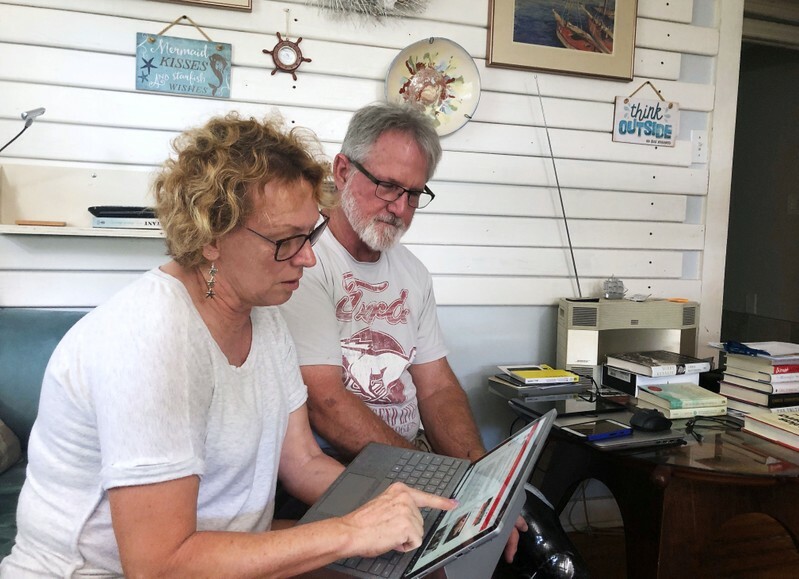 CLEARWATER, Florida/LAS VEGAS (Reuters) – After months as volunteer activists demanding that U.S. President Donald Trump be impeached, Eileen and Michael O’Brien sat on their couch on Thursday, cracked open a laptop and began to read the 448-page special counsel report that liberals have dreamed would make impeachment a reality. The release of the long-anticipated report by Special Counsel Robert Mueller on his inquiry into Russia’s role in the 2016 election landed in a stridently divided America: one side convinced Trump acted improperly, the other adamant that the investigation was a politically driven farce. Mueller built an extensive case that Trump committed obstruction of justice but stopped short of concluding he had committed a crime, though he did not exonerate the president. For those like the O’Briens who have been pining for impeachment, the report renewed resolve to oust the president. For those who want to see the president reelected, there was a sense of vindication. “The White House is going to put out their own version of things, which is basically fish wrapper,” said Michael O’Brien, formerly a service technician who now works on houses. His wife, who a day earlier delivered a can of “impeaches” peaches to a lawmaker, looked up with a quizzical expression. Lee Mueller and his wife, Michele Mueller, no relation to Robert Mueller, also paused their Thursday to read through the special counsel’s report. They printed out the table of contents for both volumes along with the executive summaries. “I view the Mueller report as being one battle in a war against the United States of America’s founding principles and against Donald Trump,” Michele Mueller, 61, said in a suburb of Las Vegas. After Attorney General William Barr released his four-page summary of the Mueller report late last month, Americans were dug in on their views. So far, the full report does not appear to have convinced many to change their opinions about the president’s conduct. A Reuters/Ipsos public opinion poll conducted Thursday afternoon to Friday morning found among those respondents of who said they were familiar with the Mueller report, 70 percent said the report had not changed their view of Trump or Russia’s involvement in the U.S. presidential race. Ahead of Thursday’s release of the Mueller report, Trump ramped up his insistence that he was the victim, not the perpetrator, of crimes. James Stratton, 65, of Clearwater, Florida, caught snippets of the news about the report from conservative commentators Rush Limbaugh and Sean Hannity. He looked up Barr’s news conference, held Thursday morning before the report was released online, on YouTube. For the most invested, though, Mueller’s report offered hope for further investigation, but by Democrats in Congress this time. Tom Steyer, a billionaire activist who has spent millions of his own dollars directing pressure at Congress to impeach Trump, said while he thinks the contents of the report implicate the president, he acknowledges the findings alone are unlikely to convince Americans to change their minds. In Florida, Margo Hammond, 69, who considers herself an independent voter, gleaned highlights by toggling through the coverage of MSNBC, CNN and Fox News. She was unimpressed with Barr. “It’s kind of an insult to the American people that we can’t decide for ourselves,” she said while in an art class. She planned to read as much as she could of the report. FILE PHOTO: U.S. President Donald Trump’s lead attorneys Jay Sekulow and Rudy Giuliani react after Attorney General William Barr sent lawmakers a summary of the key findings in Special Counsel Robert Mueller’s Russia investigation, at an office in Washington, U.S., March 24, 2019. Picture taken March 24, 2019. Courtesy of Peter Halmagyi/Handout via REUTERS. 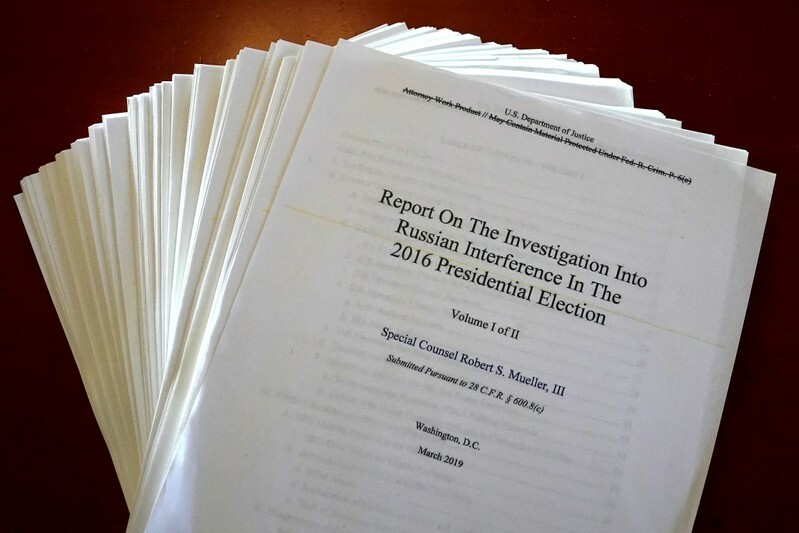 WASHINGTON (Reuters) – U.S. President Donald Trump’s personal lawyers spent at least 10 hours reviewing Special Counsel Robert Mueller’s report on Russian meddling in the 2016 election before it was made public, two of the lawyers told Reuters on Friday. Rudy Giuliani, Jay Sekulow and two other Trump lawyers went to the U.S. Justice Department on Tuesday and Wednesday for an early look at the 448-page report into whether Trump’s team colluded with Russia and whether Trump obstructed the investigation, which was released to the public on Thursday. Attorney General William Barr, who has drawn criticism from Democratic lawmakers over his handling of the Mueller probe, said on Thursday that both White House counsel and Trump’s personal lawyers had been allowed to review the redacted report. Barr gave no details about how much access they were given but Sekulow and Giuliani said they reviewed copies of the report from about 4 p.m. until at least 9 p.m. on Tuesday and from 10:30 a.m. until 3:30 p.m. on Wednesday, taking notes on legal pads. The lawyers said they gave up their cellphones and other electronic devices before being led into a Justice Department conference room in a restricted area known as a Sensitive Compartmented Information Facility (SCIF), designed to ensure secret information stays secure. 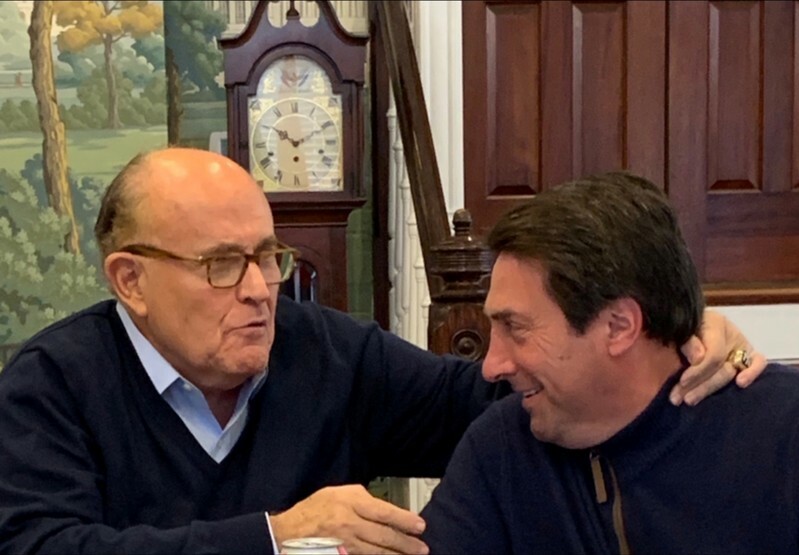 “We were doing a lot of reading, not talking,” Sekulow told Reuters, referring to himself, Giuliani, and Jane and Marty Raskin. “I had at least 30 pages of notes,” said Giuliani. 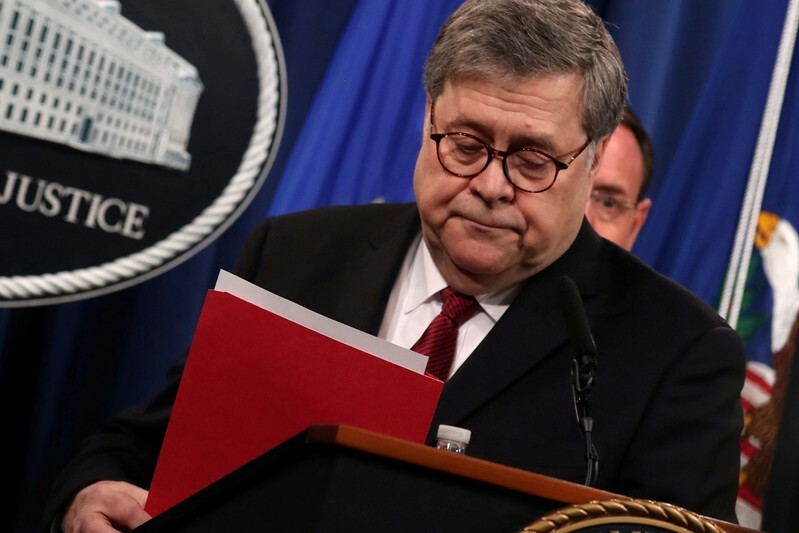 Sekulow pushed back against Democrats’ complaints that Barr had tried to help Trump by giving his lawyers an early look at the report. The disclosure followed news reports this week that Justice Department officials discussed Mueller’s conclusions with White House lawyers before the release. Giuliani said the preview reassured them that the report did not contain any bombshells. “It gave us some confidence the people who hate him will hate him, the people who love him will love him, and the people in between were not going to be persuaded,” he said. After the first session, the lawyers went back to Sekulow’s Capitol Hill offices, ordered in Chinese food and created an outline of their own about the most important details in the report, they said. On Wednesday night, they went out for Mexican food. And on Thursday night, after the report’s release, they celebrated at the Trump International Hotel in Washington. Although Mueller’s team described in detail the extensive contact Trump’s team had with Russia during the election campaign and how Trump tried to impede the investigation, it stopped short of concluding he had committed a crime or that his aides had conspired with Moscow. The team of personal lawyers was happy with the result. “No collusion and no obstruction,” Sekulow said, using a phrase often repeated by Trump. WASHINGTON (Reuters) – Congressional Democrats on Friday took legal action to get hold of all of U.S. Special Counsel Robert Mueller’s evidence from his inquiry into Russian meddling in the 2016 election, as the probe’s findings hit President Donald Trump’s poll ratings. 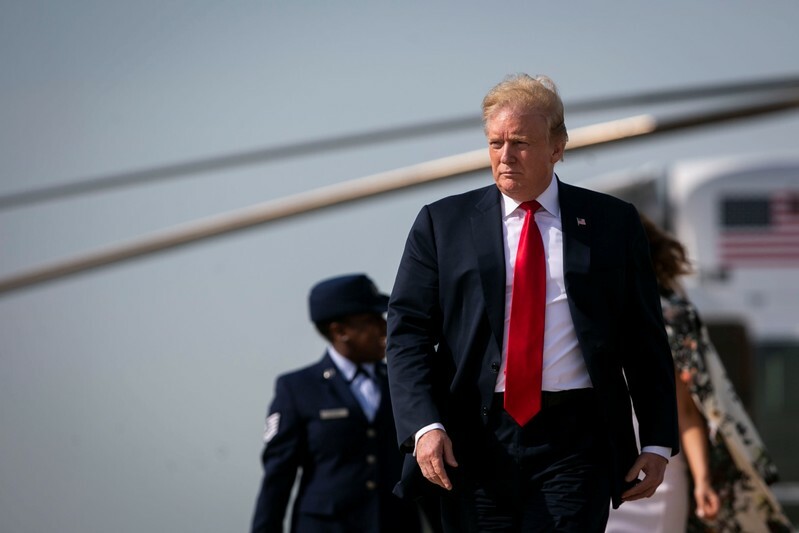 The number of Americans who approve of Trump dropped by 3 percentage points to the lowest level of the year following the release of a redacted version of Mueller’s report on Thursday, according to a Reuters/Ipsos online opinion poll. While Mueller ultimately decided not to charge Trump with a crime such as obstruction of justice, he also said that the investigation did not exonerate the president, either. U.S. House of Representatives Judiciary Committee Chairman Jerrold Nadler, a Democrat, issued a subpoena to the Justice Department to hand over the full Mueller report and other relevant evidence by May 1. “My committee needs and is entitled to the full version of the report and the underlying evidence consistent with past practice. The redactions appear to be significant. We have so far seen none of the actual evidence that the Special Counsel developed to make this case,” Nadler said in a statement. The report provided extensive details on Trump’s efforts to thwart Mueller’s investigation, giving Democrats plenty of political ammunition against the Republican president but no consensus on how to use it. The document has blacked out sections to hide details about secret grand jury information, U.S. intelligence gathering and active criminal cases as well as potentially damaging information about peripheral players who were not charged. Democratic leaders played down talk of impeachment of Trump just 18 months before the 2020 presidential election, even as some prominent members of the party’s progressive wing, notably U.S. Representative Alexandria Ocasio-Cortez, promised to push the idea. Trump, who has repeatedly called the Mueller probe a political witch hunt, lashed out again on Friday. “Statements are made about me by certain people in the Crazy Mueller Report…which are fabricated & totally untrue,” Trump wrote on Twitter. He seemed to be referring to former White House counsel Don McGahn who was cited in the report as having annoyed Trump by taking notes of his conversations with the president. Phone conversations between the president and McGahn in June 2017 were a central part of Mueller’s depiction of Trump as trying to derail the Russia inquiry. The report said Trump told McGahn to instruct the Justice Department to fire Mueller. McGahn did not carry out the order. In analyzing whether Trump obstructed justice, Mueller revealed details about how the president tried to fire him and limit his investigation, kept details of a June 2016 meeting between senior campaign officials and a Russian under wraps, and possibly dangled a pardon to a former adviser. According to the Reuters/Ipsos poll of 1,005 adults conducted Thursday afternoon to Friday morning, 37 percent of people approve of Trump’s performance in office – down from 40 percent in a similar poll conducted on April 15 and matches the lowest level of the year. The poll has a credibility interval, a measure of precision, of 4 percentage points. Representative Doug Collins, the top Republican on the House Judiciary Committee, said the Democrats’ subpoena “is wildly overbroad” and would jeopardize a grand jury’s investigations. The Mueller inquiry laid bare what U.S. intelligence agencies have described as a Russian campaign of hacking and propaganda to sow discord in the United States, denigrate 2016 Democratic candidate Hillary Clinton and boost Trump. Russia said on Friday that Mueller’s report did not contain any evidence that Moscow had meddled. “We, as before, do not accept such allegations,” Kremlin spokesman Dmitry Peskov said. Trump has tried to cultivate good relations with Russian President Vladimir Putin, and came under heavy criticism in Washington last year for saying after meeting Putin that he accepted his denial of election meddling, over the conclusions of U.S. intelligence agencies. Half a dozen former Trump aides, including former campaign chairman Paul Manafort, were charged by Mueller’s office or convicted of crimes during his 22-month-long investigation. The Mueller inquiry spawned a number of other criminal probes by federal prosecutors in New York and elsewhere. One reason it would be difficult to charge Trump is that the Justice Department has a decades-old policy that a sitting president should not be indicted, although the U.S. Constitution is silent on whether a president can face criminal prosecution in court. A paragraph in the report is at the heart of whether Mueller, a former FBI director, intended Congress to pursue further action against Trump. “The conclusion that Congress may apply the obstruction laws to the President’s corrupt exercise of the powers of office accords with our constitutional system of checks and balances and the principle that no person is above the law,” Mueller wrote. Republican Collins said Democrats had misconstrued that section of the report to suit their anti-Trump agenda. “There seems to be some confusion…This isn’t a matter of legal interpretation; it’s reading comprehension,” Collins wrote on Twitter. “The report doesn’t say Congress should investigate obstruction now. It says Congress can make laws about obstruction under Article I powers,” Collins said. Nadler told reporters on Thursday that Mueller probably wrote the report with the intent of providing Congress a road map for future action against the president, but the Democratic congressman said it was too early to talk about impeachment. House Democratic leader Steny Hoyer on Thursday advised against an immediate attempt to impeach Trump. “Very frankly, there is an election in 18 months and the American people will make a judgment,” Hoyer told CNN. But the House Oversight Committee’s Democratic chairman, Elijah Cummings, said impeachment was not ruled out. “A lot of people keep asking about the question of impeachment … We may very well come to that very soon, but right now let’s make sure we understand what Mueller was doing, understand what Barr was doing, and see the report in an unredacted form and all of the underlying documents,” he told MSNBC. Short of attempting impeachment, Democratic lawmakers can use the details of Mueller’s report to fuel other inquiries already underway by congressional committees. Only two U.S. presidents have been impeached: Bill Clinton on charges of perjury and obstruction of justice in 1998 and Andrew Johnson in 1868 after firing his secretary of war in the tumultuous aftermath of the American Civil War. Both were acquitted by the Senate and stayed in office. In 1974, a House committee approved articles of impeachment against President Richard Nixon over the Watergate scandal but he resigned before the full House voted on impeachment. NEW YORK (Reuters) – The number of Americans who approve of President Donald Trump dropped by 3 percentage points to the lowest level of the year following the release of a special counsel report detailing Russian interference in the last U.S. presidential election, according to an exclusive Reuters/Ipsos public opinion poll. The poll, conducted Thursday afternoon to Friday morning, is the first national survey to measure the response from the American public after the U.S. Justice Department released Special Counsel Robert Mueller’s 448-page report that recounted numerous occasions in which Trump may have interfered with the investigation. According to the poll, 37 percent of adults in the United States approved of Trump’s performance in office, down from 40 percent in a similar poll conducted on April 15 and matching the lowest level of the year. That is also down from 43 percent in a poll conducted shortly after U.S. Attorney General William Barr circulated a summary of the report in March. While Mueller ultimately decided not to charge Trump with a crime, he also said that the investigation did not exonerate the president, either. Forty percent said they thought Trump should be impeached, while 42 percent said he should not. The poll responses were sharply split along party lines, with Democrats much more critical of Trump than his fellow Republicans. The Mueller investigation had previously charged 34 other people and three Russian entities, netting convictions or guilty pleas from several Trump associates including former campaign chairman Paul Manafort, White House national security adviser Michael Flynn and longtime personal attorney Michael Cohen. So far, the report does not appear to have convinced many to change their opinions about the president’s conduct during a bitter presidential campaign, whether his inner circle improperly engaged with Russian agents, or if he tried to interfere with federal investigators afterward. The Reuters/Ipsos poll was conducted online in English throughout the United States. 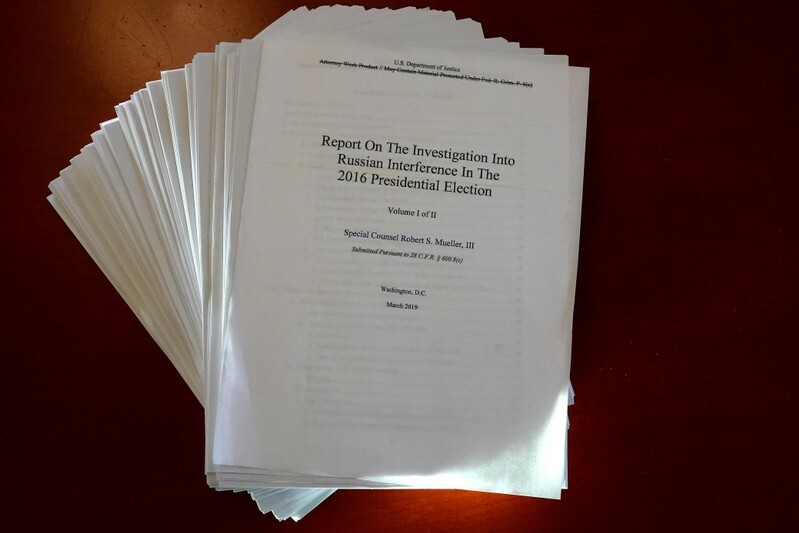 It gathered responses from 1,005 adults, including 924 who were familiar with the Mueller report. It has a credibility interval, a measure of precision, of 4 percentage points. NEW YORK (Reuters) – Sitting on a working-class commercial strip in the shadows of an above-ground rail line, a group called Make the Road New York’s busy street-level offices are easy to miss. But its mission to support and advocate for immigrants is front and center. A sign on its front door in a heavily Hispanic neighborhood of the borough of Queens warns law enforcement officers not to enter without a warrant. Its colorful lobby is filled with butterfly-shaped placards made for protests against the hardline immigration policies of President Donald Trump, a fellow New Yorker. The plan’s legality will be tested on Tuesday in arguments before the U.S. Supreme Court, which has a 5-4 conservative majority. The nine justices will consider whether Commerce Secretary Wilbur Ross, whose department includes the Census Bureau, violated a federal law called the Administrative Procedure Act and the U.S. Constitution’s mandate to enumerate the nation’s population every 10 years. A ruling is due by the end of June. On Jan. 15, Manhattan-based U.S. District Judge Jesse Furman ruled against the administration and blocked the use of the question. Two other courts also have blocked the question since then. The case comes before the court in a pair of lawsuits, one filed by a group of states and localities led by New York state, and the other by immigrant rights groups including Make the Road. “We have seen a lot of anti-immigrant rhetoric and a lot of attacks on our communities, and this is just another one on a long list,” said Theo Oshiro, Make the Road’s deputy director, who is leading its efforts on the census. Opponents have called the question a Republican effort to frighten immigrant households and Latinos from participating in the census, leading to a severe and deliberate undercount, diminishing the electoral representation of Democratic-leaning areas in Congress and costing them federal funds. This would benefit Trump’s fellow Republicans and Republican-leaning parts of the country, they said. The Constitution mandates a census every 10 years. The official population count is used to allocate seats in the U.S. House of Representatives and distribute some $800 billion in federal funds. The Trump administration said the citizenship question will yield better data to enforce the Voting Rights Act, which protects eligible voters from discrimination. While only U.S. citizens can vote, non-citizens comprise an estimated 7 percent of the population. A number of key services that Make the Road provides, from adult English language classes to helping people find health insurance, could be put at risk, Oshiro said. “The impact would be dire,” Oshiro added. Furman found that Ross concealed his true motives for adding the question. The judge said the evidence showed that Ross and his aides convinced the Justice Department to request a citizenship question, and that he made the decision despite Census Bureau evidence that such a question would lead to lower census response rates and less accurate citizenship data. 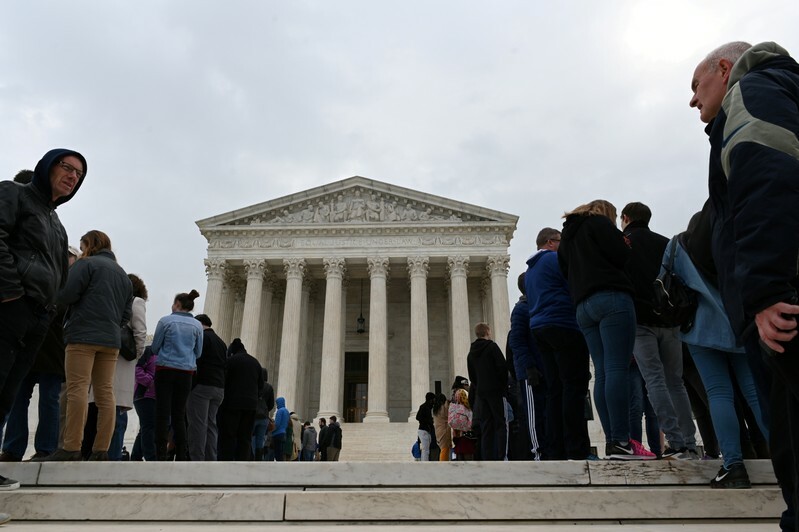 The administration appealed the case directly to the Supreme Court, bypassing a federal appeals court, given the need to resolve the matter before census forms are printed in the coming months. Francisco called the citizenship question “wholly unremarkable” and disputed that it would lead to less accurate data. Citizenship has not been asked of all households since the 1950 census but has featured since then on questionnaires sent to a smaller subset of the population. On weekday afternoons, Make the Road is a beehive of activity, its clients a mix of citizens and non-citizens. The lobby is packed, with staff providing services such as child care, food assistance and legal advice. The adult English learners are jammed into a small classroom. When asked about the census, most are hesitant to offer an opinion. One 36-year-old woman, who works as a house cleaner and gave her name only as Nelly, said people are concerned about the confidentiality of the census and if their information could be used against them or family members. She said she would not fill out the census if the citizenship question were included. Oshiro’s organization has mounted outreach efforts in subways and other places emphasizing the importance of the census to protecting federal funding and ensuring political power. In the lawsuit spearheaded by New York state, the judge found a “veritable smorgasbord” of violations of the Administrative Procedure Act. The separate suit by the New York Immigration Coalition, Make the Road and other civil rights groups, represented by the American Civil Liberties Union, also claimed that the administration was discriminating against non-white immigrants. The judge said there was no evidence of that. WASHINGTON (Reuters) – Attorney General William Barr could have buried Special Counsel Robert Mueller’s Russia report deep in the recesses of the U.S. Justice Department and simply told the public that President Donald Trump would not face criminal prosecution. “These reports are not supposed to be made public,” he said at a news conference on Thursday morning. By releasing a redacted version of the report on Thursday, Barr followed through on a promise he had made months earlier to make as much of Mueller’s findings public as possible. But that opened Barr up to widespread criticism from Democrats and some legal experts, who questioned his decision not to charge Trump with obstruction of justice, and accused him of acting like the president’s personal defense lawyer. Mueller’s 448-page report outlined 10 episodes in which Trump tried to get the special counsel fired, limit the scope of his investigation, or otherwise interfere with the probe. Mueller stopped short of concluding that Trump had committed a crime, but did not exonerate him of wrongdoing either, leaving Barr or Congress the option to take action against the Republican president. Some experts said Barr should have brought charges. “To me, they laid out a chargeable obstruction case,” said Shanlon Wu, a former federal prosecutor who represented Rick Gates, the former Trump deputy campaign chairman who has pleaded guilty to conspiracy and making false statements and is cooperating with the investigation. Barr’s news conference, held before the report’s release, provided more fodder for his critics. At several points, Barr echoed Trump’s mantra that Mueller had found “no collusion” with Russia. To some, it was a disappointing performance from a man who had been praised for upholding the Justice Department’s independence during a previous stint as attorney general from 1991 to 1993. “He’s really shown himself to be principally focused on defending the president,” said Robert Litt, a former federal prosecutor who had supported Barr’s nomination for the job. A Justice Department official, speaking on condition of anonymity, said Barr did not mislead the public because the White House cooperated with the probe despite Trump’s numerous statements criticizing it. The official also said Mueller had a choice to either recommend charges against Trump or not, and he had decided against it. The top two Democrats in Congress, House of Representatives Speaker Nancy Pelosi and Senate Democratic leader Chuck Schumer, accused Barr of deliberately distorting Mueller’s findings. Representative Eric Swalwell, one of the more than 15 Democrats running for president, called on Barr to resign. Rudy Giuliani, Trump’s personal lawyer, had a different perspective. “I think Barr is a straight lawyer. He’s an honest man,” he said. In one area at least, Barr exceeded expectations. Democrats had worried that he might use too heavy a hand when redacting portions of the report that dealt with sensitive material, such as ongoing investigations, confidential legal proceedings and matters of national security. In the end, 6 percent of the report was blacked out, according to ProPublica. Starting next week, 12 top lawmakers and their staffers will be able to see a more complete version in a secure reading room. Still, if Democrats were pleasantly surprised by the extent of the redactions, they were not saying so, and Barr is sure to face pointed questions when he testifies before Congress in May. Democratic Representative Jamie Raskin, a member of the House Judiciary Committee, compared Barr to Trump’s early mentor Roy Cohn, a political fixer best known for his involvement in Senator Joseph McCarthy’s anti-communist scare campaigns of the 1950s. Trump “may have found his Roy Cohn in Attorney General Barr. But it may be too late, because the truth has come out about how the White House operates in the Mueller report,” Raskin said. To some in Trump’s camp, the criticism was a sign of a job well done. CLEARWATER, Florida/LAS VEGAS (Reuters) – After months as volunteer activists demanding that President Donald Trump be impeached, Eileen and Michael O’Brien sat on their couch on Thursday, cracked open a laptop and began to read the 448-page special counsel report that liberals have dreamed would make impeachment a reality. For those like the O’Briens who have been pining for impeachment, the report renewed a resolve to oust the president. For those who want to see the president reelected, there was a sense of vindication. After Attorney General William Barr released his four-page summary of the Mueller report late last month, Americans were dug in on their views. 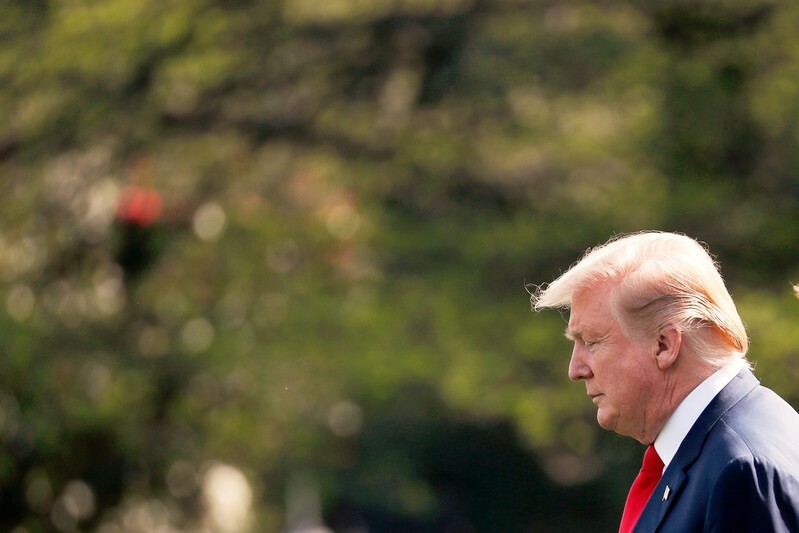 Nearly half of all Americans still believe Trump worked with Russia to interfere in the 2016 presidential election, despite the report’s saying no collusion had occurred, according to a Reuters/Ipsos poll conducted shortly after the Barr summary was released. Among those familiar with Barr’s summary, only 9 percent said it had changed their thinking about Trump’s ties to Russia, the poll found.